Impatience is my biggest weakness, so that’s my personal challenge. My fascination with Gibson, especially the 58-59-60 bursts, means that this project can't be anything else. I have done a lot of reading on the construction of the 58-59-60 bursts. This is territory for obsessives & endless debate. I initially started out with idea that I would like to build a few completely accurate ’59s. The first thing I've decided is to build a few of them. 2 reasons for this: If I mess something up, then all my eggs are not in one basket. Secondly, with the jig building, lumber sizes etc. 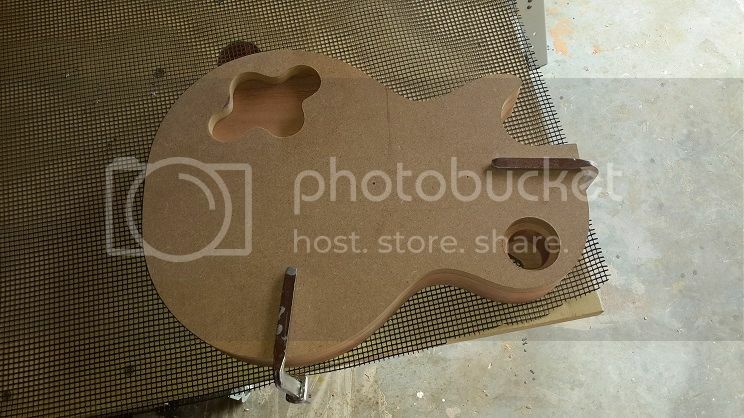 Its just not worth the effort to make one guitar. Through all the reading I have done, I have seen a lot of DIY build threads that just die. I promise I won’t do that. If I mess up, I’ll post it. That ambition of “completely accurate” has changed with a bit of discovery, most importantly: the availability of Brazilian rosewood, Honduras mahogany (Swetenia). The price & ethics that go with this are both a problem for me. The price of repro bridges, switches, fret-board inlays etc. is extreme. I am not sure that a first build will justify that outlay. These decisions need to be made as I go. Pickup rings that are "repro" can easily cost R2 000 with shipping & duties to add. Ridiculous. I've bought plans which I think are mostly accurate. They were supposedly modelled on 3 bursts that the drafter had access to. There are one or 2 details that haven’t 100% added up for me & some info that is missing. I have worked out my adjustments to these and think I have a good idea of what to do. I've bought African mahogany & sapele for the necks. I have been unable to find any info or sources for featherweight African mahogany, but I know it exists. It won’t be playing a part in this build. 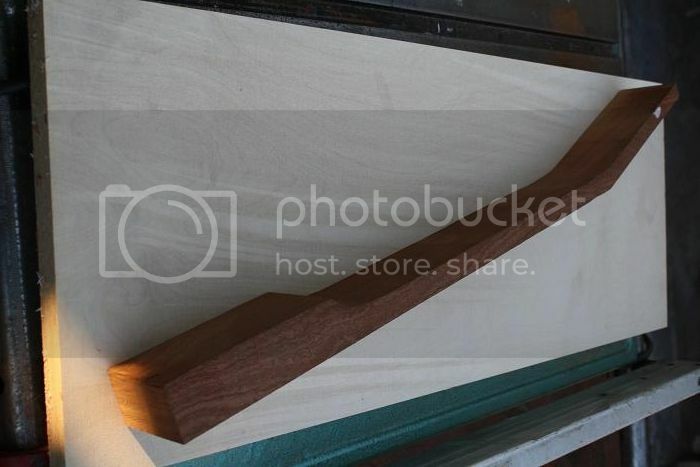 I have read that some of the bursts had sapele necks. 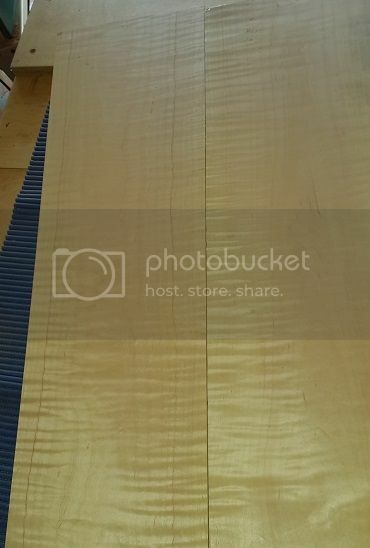 I have ordered 2 pieces of tiger maple – eastern red maple. This was mostly what was used on the bursts. I want to make as much as I can, within reason. I will definitely do all the woodwork. I’m going to make & wind my own pickups. Obviously, tuners, tailpiece, bridge etc should be bought. I think it makes economic sense to make things like hide glue, fish glue & some of the plastic fittings. I've started with making the body templates & will post those later. A very ambitious project. Hat's off to you sir. Have you considered working your way up to the 'burst? Starting with a LP Junior or Special (or even a Tele). And then using the skills you learn from those to make the 'burst... That'll also give you time to source the right woods and hardware at the best prices - and make sure there is less chance of making mistakes with some prime woods. Alan Ratcliffe wrote: A very ambitious project. Hat's off to you sir. I know you're right. I toyed with a few options. The Junior would probably have been the reasoned & sensible choice. but ... the burst maple top. I can't help myself. I know its a big ask. 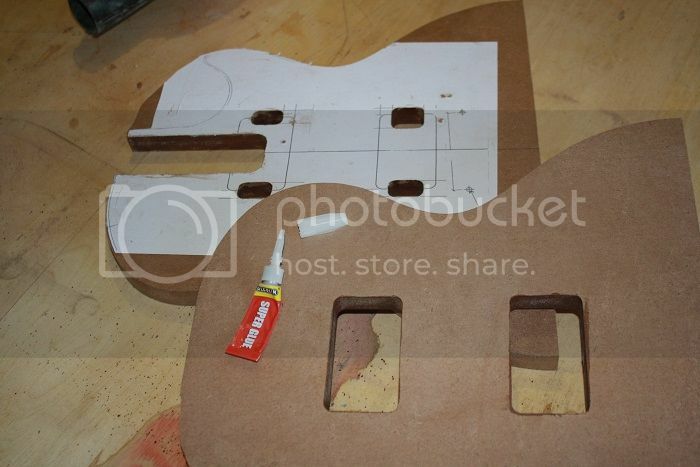 Edit: i started prepping to build 2 Teles, but have stopped that. My interest in LP's & their construction took over. If anyone I know can do it, it's you mate. Give it hell. Based on the quality of your amps and cabs that I've seen on here this is going to be a cracker! Your little bullet list is spot on!! I'm assuming you seen Preeb's staggering build thread on TDPRI? Edit: You might want to consider starting a simultaneous thread on mylespaul. Not only will those guys love to see what you do, but there are super-experienced luthiers on there if you need help with problem solving. YAY!!!! Something cool to look at and read! Rikus wrote: Based on the quality of your amps and cabs that I've seen on here this is going to be a cracker! Your little bullet list is spot on!! Gil is a key resource. In info & spirit. I think you'll see some familiar techniques... Some things will also be different. It would be good, but with work, family & build time, it might be too much. For now, i'll keep it local. There's also good reason - we face a whole other set of challenges with materials & shipping costs. Local knowledge and sharing might help all of us there. Worst case, we can group-commiserate at the costs of doing this stuff in SA. shaunf wrote: YAY!!!! Something cool to look at and read! If this is half as interesting as your Trainwreck build thread, I'll be happy. OK - here's the first few steps. I bought a bandsaw & a few Stew Mac bits & pieces in December. I've never used a bandsaw before. 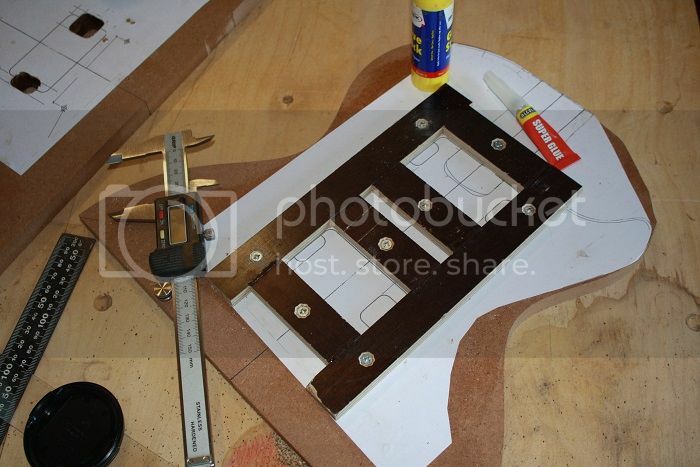 It is a really great tool to have - & vital for cutting out stuff. I climbed in & rough cut the necks. I've let them stand for 5 weeks for the wood to settle. 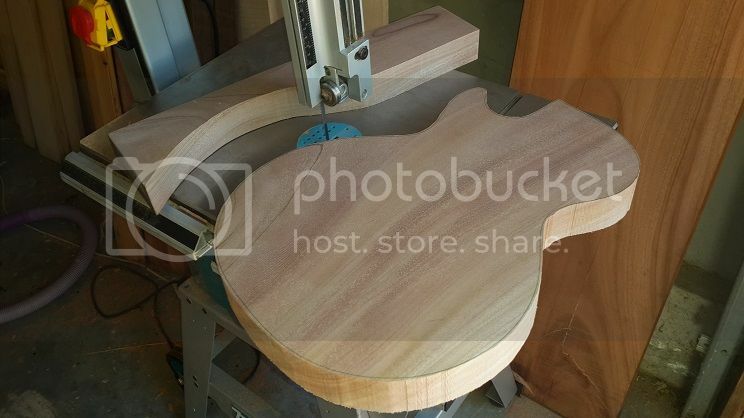 The Gibson necks apparently were not cut with the grain running completely parallel to the neck. The grain runs slightly down from fingerboard to the back of the neck, moving from the body to the headstock. I'm not 100% sure on the reason but this would definitely make for a stronger neck. It also means that using a draw knife to shape the neck would avoid any digging into the grain. 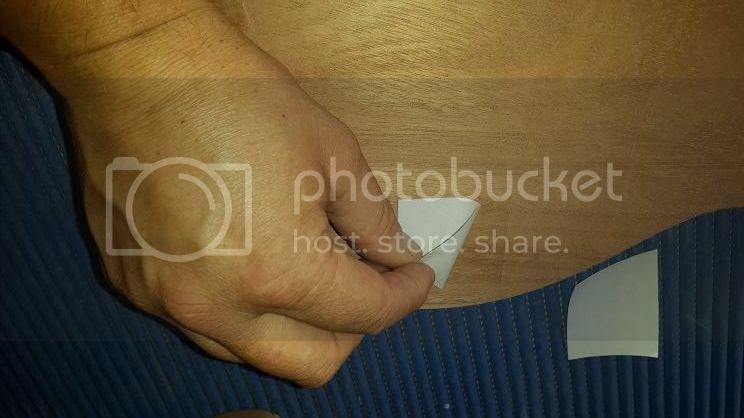 Body templates have also been cut. 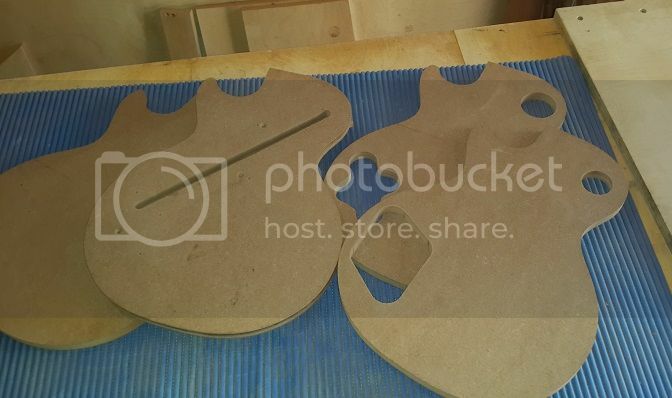 I glued my drawings onto the particle board, cut with a bandsaw & drilled open the cavities. I did the detail with a spindle sander. Here's the progress on the body. 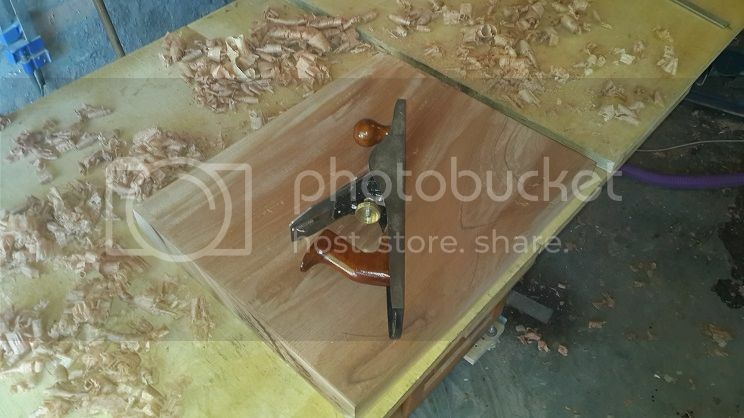 Hand plane the slabs. I've never used a hand plane, but when sharp, its great fun. Mahogany if difficult. I found that some parts had to planed left to right, & some right to left to avoid tear-out/ burr. A bit of a learning curve. It seems the grains wind a bit erratically. I forgot to take a pic of the routing of the outline. Robosanding leaves a small lip that can be flush trimmed with a table router. I was bit nervous & forgot the pic. It was easy though, but can be very dangerous. 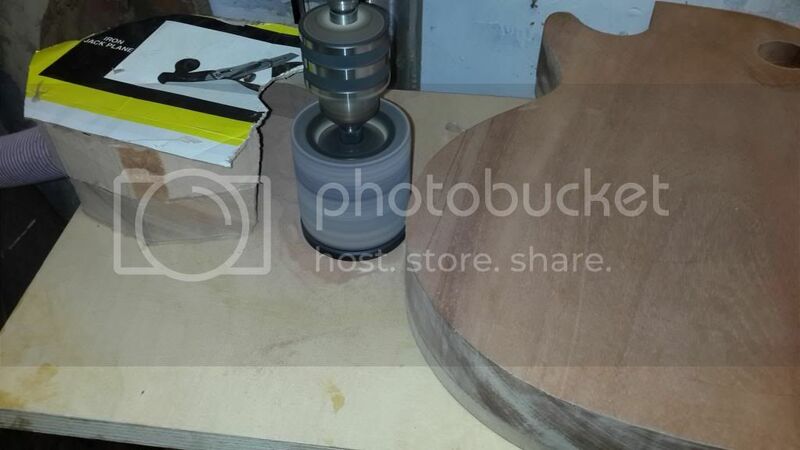 The control pots cavity will get second route after the maple top is fitted and shaped. More about that later, but for me it is a definitive feature of the bursts. I need a new router bit to do the rebates on the back for the cover plates. I can't find the right size locally, so that will have to wait. I've also found that if you wipe a bit of CA glue into the sides, it hardens & preserves them. The edges are straight, the ripple is just from the CA glue. Presumably you'll only route the pickup cavities once the neck's on? The grain on those backs looks delicious. singemonkey wrote: Weeehooo! It begins. The fingerboard is fitted to the neck before its glued. It won't be possible to route the pickup cavities with the fingerboard in the way. There's a sequence with all the planes and angles involved. Its a very interesting part of the burst. I'll hopefully get it right & give some detail I have some jigs & ideas worked out to do this effectively. Excellent job so far! Very exciting to watch. Doing something like this is a dream of mine, but currently I have absolutely zero wood working experience. Yeah! So exciting. Please keep the pictures flowing! 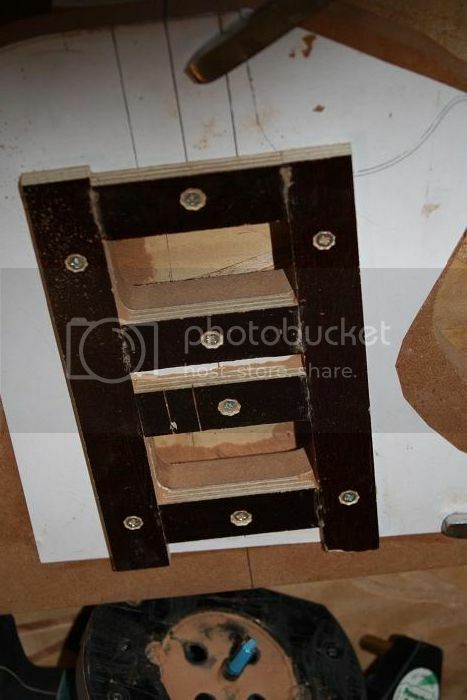 Its called a "counterbore" or "spotfacer" the one I need is 3/4" with an internal hole of 3/16" its used to drill the hole above the nut where the truss rod is accessed. The empty truss channel acts as the guide for the bit's centre pin (not shown in the picture). I have a 3/4" Forstner bit & need a 3/16" hole drilled accurately down the middle of it - where the center point is. If the hole is not dead centre, then you will get wobble & tear when drilling. Does anyone know where I could get this done in Cape Town? I could buy the spotfacer online for about R500, would only mod the Forstner if it was much cheaper. 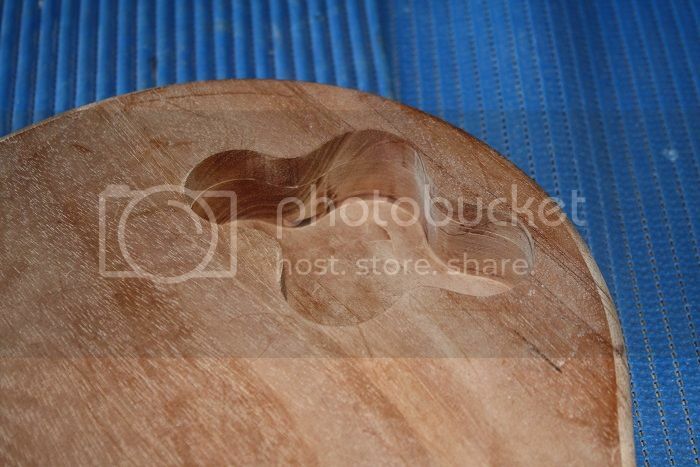 Also, here are some pics of the maple tops. 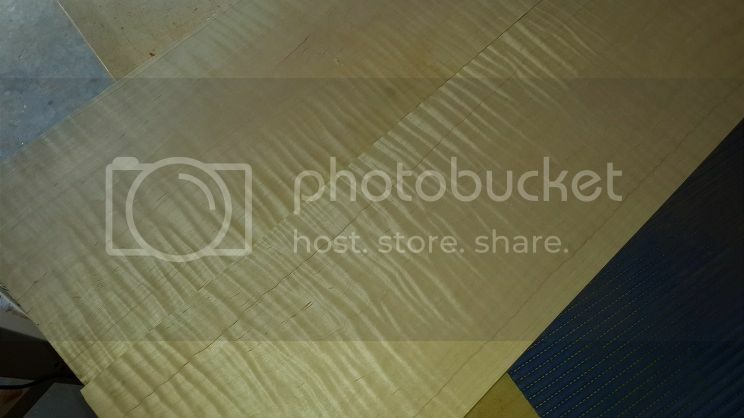 I need to split them on the bandsaw for bookmatching / flitchmatching. I think I can get 4 tops from this. I think this figure is impressive. It will get better with finishing. The original bursts had varied - and often little or no figure. Its still a cherished feature & a lot the individual character in each resides in the maple top.... So here's where I start getting to know the instruments. I have already lost some time - just looking. I'm working on a brace to help split these nicely. I have no room to play with if I want to stay in spec. Nervous... I don't want to mess this up. Great looking maple. Not too regular to be interesting. I like this thread already. Keep it up man, I can't wait to see the finished product.